Life is an ocean - Jump in! Paddle with Your Plus Sized Pup! Your Posterior Will Thank You! What Size Kayak Do I Need? Walleye Fishing Tips and Tactics: Locate, Catch & Cook! 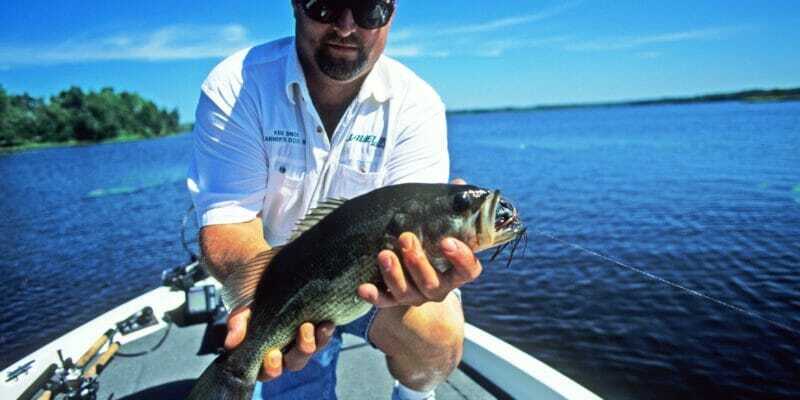 How Does a Fish Finder Work & How to Read One? Can Fish See in the Dark? Your Fingertips Will Thank You! What’s The Best Dive Knife? 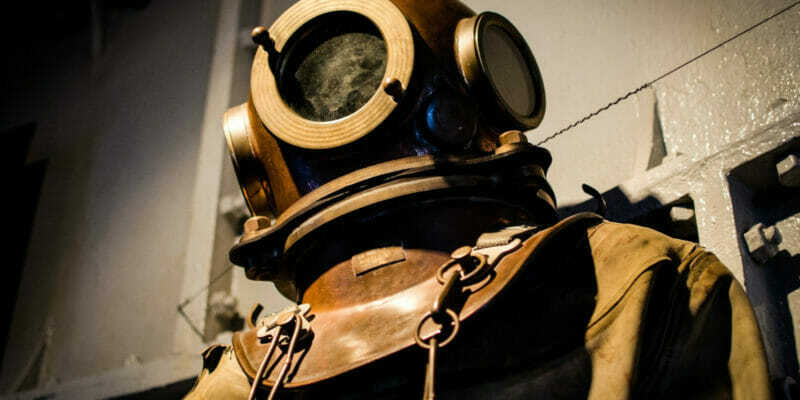 How Deep Can a Human Dive? You are here: Home / Kayak / 5 Best Kayaks for Large Dogs: Paddle with Your Plus Sized Pup! Owning a big dog doesn’t mean you’re limited to playing fetch with your pooch in the dog park! In fact, many large dogs love being in a kayak out on the water. No matter what the weather is like – rain, sun, waves or snow – you’d be hard pressed to find a more reliable paddling companion. While kayaking with your pooch is great fun, you’ll want to make sure you get the right kayak for the job. After all, a big dog can easily capsize a less stable kayak – and trying to re-enter a kayak with an agitated, drenched canine can be a major pain! What’s the Best Kayak for me and my Dog? What to Bring When Kayaking with your Dog? This large, stable sit-on-top kayak is the perfect choice for paddling with any large dog. It’s designed to be highly versatile and can be configured to use solo, tandem or with a pet/child. There are two main seating positions, in the front and rear – plus an extra ½ seat position in the middle of the boat. You can detach and adjust the position of both seats, so if you’re paddling solo with your pooch you can remove the front seat and paddle from the rear. The hull is built for maximum stability, which is important when paddling with a big dog on board. Multiple foot positions allow you to brace your feet comfortably regardless of your height. There are two molded-in carry handles on each side of the deck, plus a skid plate and a front handle. This makes the kayak easy to drag over sand or dirt. At 62 pounds, it’s not the lightest kayak out there, but most people report they can load and unload it from a roof rack by themselves. This versatile, stable sit-on-top kayak is great for a variety of tasks – including fishing and paddling with your canine companion. The hull is built to be extremely stable, which allows you to stand up while casting off or sit side-saddle without tipping over. 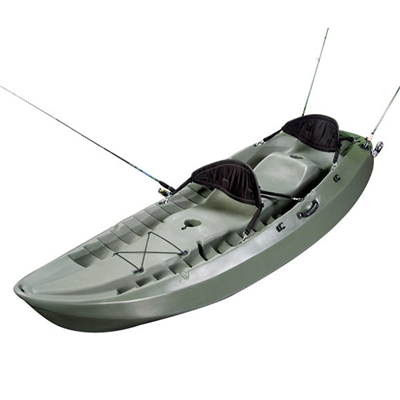 Made of durable polyethylene plastic, and with a weight capacity of 500 pounds (227 Kilos), this kayak is a floating tank. The design favors stability and ruggedness over speed and maneuverability, which is perfect for holding a big pup. Seating can be configured for either solo or tandem paddling, or the front seat can be removed to make room for a larger dog. There are three fishing rod holders included, as well as a watertight rear storage hatch for keeping important gear dry. This model also comes with two double-sided paddles, as well as side-mounted paddle clips to store them. Lastly, a 5-year manufacturer warranty is included, so you’re covered in case this bad boy was to malfunction. This budget inflatable performs well above its price range – plus it’s one of the most dog-friendly kayaks available. The hull is made from thick 33mm Polykrylar PVC, which provides extraordinary tear resistance – and can withstand dog claws. 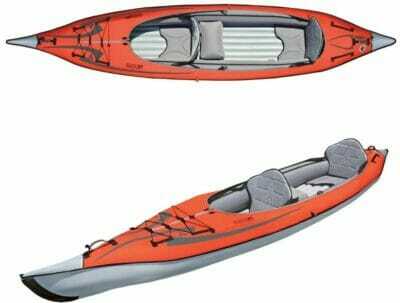 With a 500-pound weight capacity, the kayak can hold two adults easily, or an adult with a large dog. Weighing in at only 26 pounds when deflated, this kayak is super easy to transport. It’s a great choice for camping, fishing or backpacking. It comes with two paddles, two deluxe seats, a foot pump, and a convenient carry bag. The two seats are adjustable and removable, so when kayaking with your dog you can remove the front seat for more space. The kayak can be fully inflated with the included foot pump in less than 10 minutes. There is also a repair kit included, should you develop a leak. Tracking and speed are surprisingly good for an inflatable, thanks to 2 skegs located on the bottom of the boat. Versatile, portable, and tough, this inflatable kayak is an outstanding choice for many kayaking situations. Like all inflatable kayaks, it works great when camping, hiking, or anytime space is at a premium. If you don’t want to bother getting a roof rack, this inflatable will easily fit in the back of your trunk. There is plenty of room inside the hull, and the seats can be configured for either solo or tandem paddling. If you’re using it with your dog, you can configure the rear seat all the way in the back, which leaves plenty of room up front for a plus-sized pooch. Three layers of puncture resistant material make the hull extra tough and able to handle rocks, shale, and beaches. Provided your dog’s nails are trimmed, you should have no issue with leaks. There is also an optional drop stitch floor which makes the kayak floor more rigid and durable. Inflating the kayak takes 10 – 15 minutes with a hand pump or less than 5 minutes with an electric pump. Tracking is also quite impressive for an inflatable kayak, many users report the tracking feels identical to a hard-bodied kayak. Sleek, spacious, and durable, this sit-in kayak is an excellent choice for kayaking with a large dog. It’s slightly narrower and shaped more like a touring kayak than the previously reviewed kayaks. That means it will cut through the water quickly – while sacrificing some stability. If you’re taking your dog with you in this kayak, be sure they’re well trained and not prone to jumping around unexpectedly. The polyethylene plastic hull is highly durable; Old Town even provides a lifetime hull warranty with purchase. The two cockpit openings are large and non-confining, which is perfect for a big pup. There are a variety of possible seating configurations: solo, tandem, and a third child sized jump-seat for a third passenger. When using the kayak with your dog, you can move the rear seat slightly forward, and allow the dog to sit in the front cockpit opening. 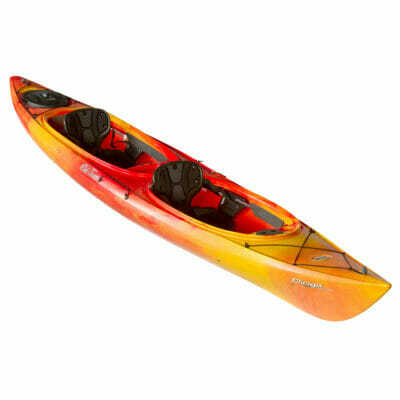 The kayak comes with two cushioned, contoured seats which are easily adjustable. There are also two watertight storage hatches, and two bungee storage areas for lashing gear. The best kayak for you and your dog will largely depend on the size and temperament of your dog. Larger dogs will obviously need more space than smaller ones. Well-behaved dogs will be much easier to handle on the water and can be placed in a less stable kayak without concern for capsizing. A kayak’s dimensions are a major factor in determining how stable it will be on the water. Many touring kayaks have a width between 18 and 25 inches. 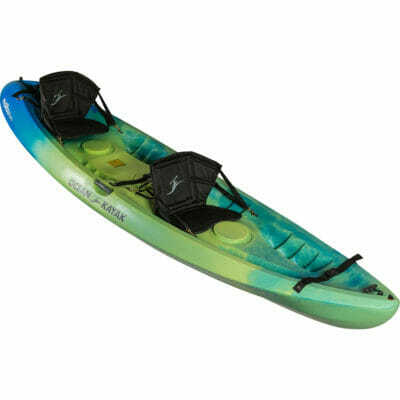 This allows the kayak to travel quickly through the water with the minimum amount of resistance. It also makes this type of kayak less stable – and not ideal for taking a four-legged companion along. Recreational kayaks typically have a width between 28 and 36 inches. This width provides a larger surface area for the kayak’s base – making these kayaks more stable and suitable for bigger dogs. As well as knowing the kayaks dimensions, it’s important to measure your dog’s dimensions too! You want to make sure your pup can fit comfortably inside the hull, and have enough room to turn sideways with all four legs inside the boat. It’s a good idea to check your dog’s weight before jumping on a kayak, as too much weight could make the kayak less stable and efficient. 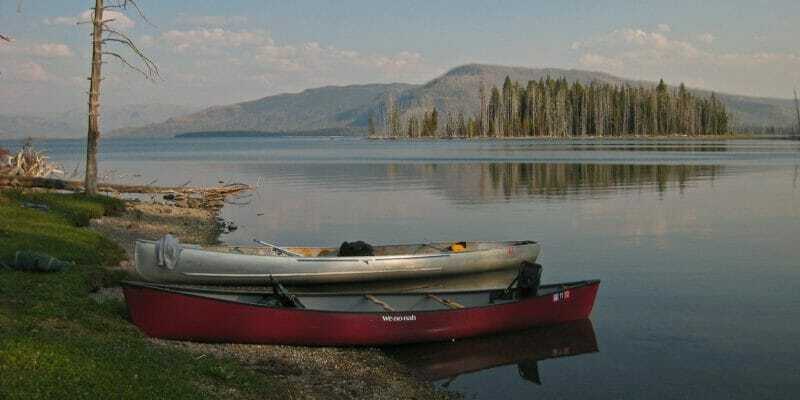 The weight limits for all the kayaks I’ve reviewed here are between 425 – 550 pounds, so you should be fine with yourself plus a dog and your gear. Tandem kayaks are longer and can hold more weight than single kayaks. If your dog is a big boy or girl (over 40-50 pounds) a single kayak will probably be too cramped for them. 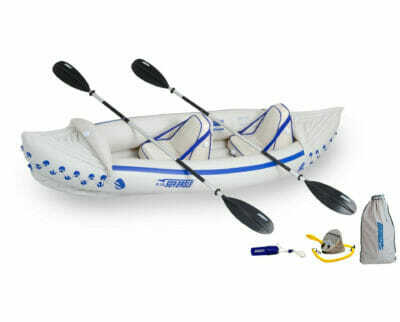 A tandem kayak will have a separate seating area for your dog to sit, plus more storage area for gear, food, and drinks. Sit-on-top kayaks offer more flexibility and are generally more stable than their sit-in counterparts. 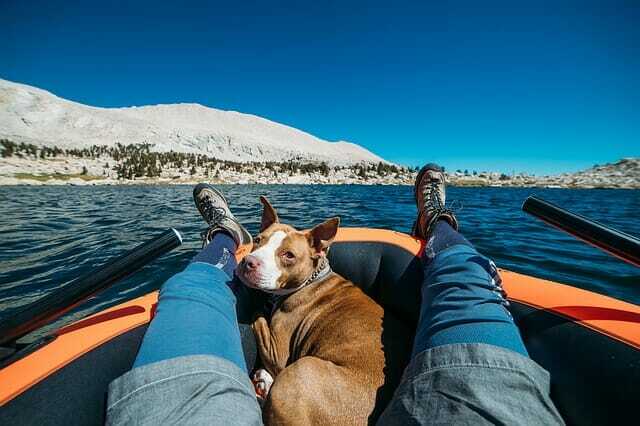 A sit-on-top kayak will give your dog more room to move around, as well as the freedom to easily hop in and out of any lake, river or ocean. These kayaks also have self-draining scupper holes built into their hulls, which allows any water that seeps in to drain away. If you do manage to capsize, re-entering a sit-on-top kayak is fairly simple. Sit-on-top kayaks are also typically less expensive and easier to use than sit-ins. If you’re looking for a stable, affordable kayak that can handle you plus a large furry friend, you can’t go wrong with a sit-on-top. They aren’t the fastest or most maneuverable type of kayak, but that’s probably not what you’re looking for anyways. 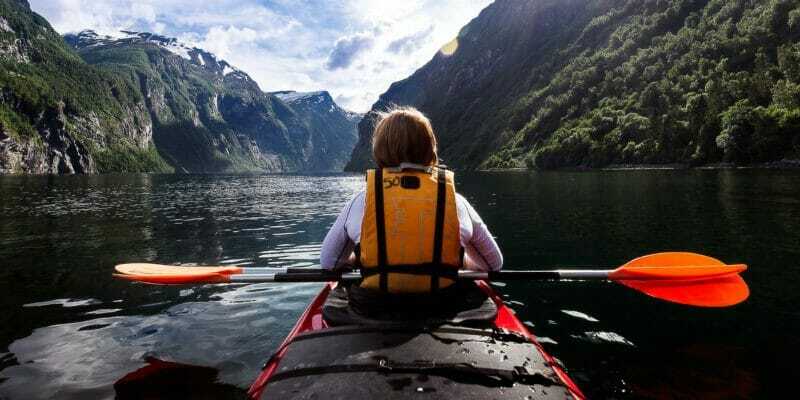 If you plan on using your kayak for longer than a few hours, a good aftermarket seat will support your back and ensure your paddling experience is as comfortable as possible. Interestingly, fishing kayaks are some of the best dog-friendly kayaks available on the market. They’re designed for maximum lateral stability, which works perfectly for kayaking with a large dog. Built with extra wide hulls, theses kayaks enable a fisherman to stand upright while casting off. Inflatable kayaks might not be the first thing you think of when considering a kayak for dogs. Won’t their claws tear through the material and sink the boat? Actually, no. Modern inflatables are made from extremely durable PVC and are able to handle rocks, gravel, and even rapids. Think of the type of material used in a whitewater raft or rubber dingy. Inflatables have other advantages as well. They’re lightweight, easy to set up, and you don’t need a roof rack to transport them. Many inflatables are also more spacious than traditional hard bodied kayaks. 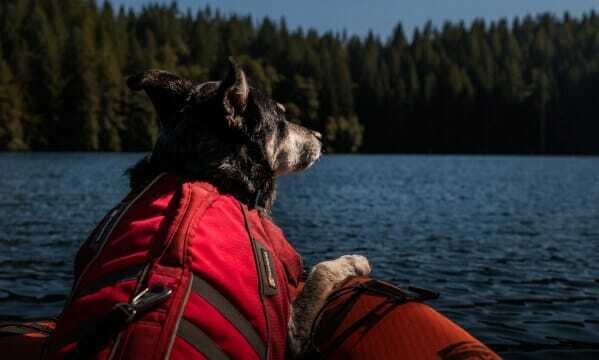 Along with all your usual kayaking gear, bringing a few extra things will make your dog’s kayaking experience that much better. Life vest. Life vests aren’t just for humans! Even if your dog is a great swimmer, a canine life vest is a great investment. Knowing that your dog is safe will give you peace of mind, and make your paddling experience that much better. Water. Some drinking water is a good idea, especially on hot days or when kayaking in salt water environments. Leash & Harness. Bringing a leash along is a good idea – especially if you plan on exiting the boat, or doing an overnight trip. A harness makes it easier to grab your dog and lift them back inside the kayak in case they jump in the water. 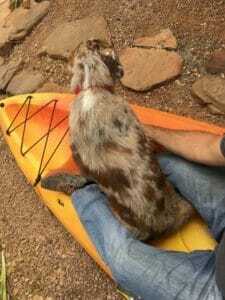 Make sure never to tie your dog to the kayak! They need to swim freely in case you capsize. Sunscreen. Sunscreen is important for your dog’s nose and belly, especially if your dog’s breed is susceptible to sunburn. Treats. Don’t forget to reward your pup for their good behavior! Treats or rewards are great for positive reinforcement and will help train your dog to behave while on the water. Getting used to a kayak on land first is a smart idea! Acclimating your dog to being in a kayak ensures that both of you have a rewarding experience. The first step should be to get the dog used to the kayak (do this on dry land), as well as used to wearing their life vest. Using their favorite toy is a great way to make them more comfortable during this process. The next step is to train your dog to get in and out of the kayak on command. 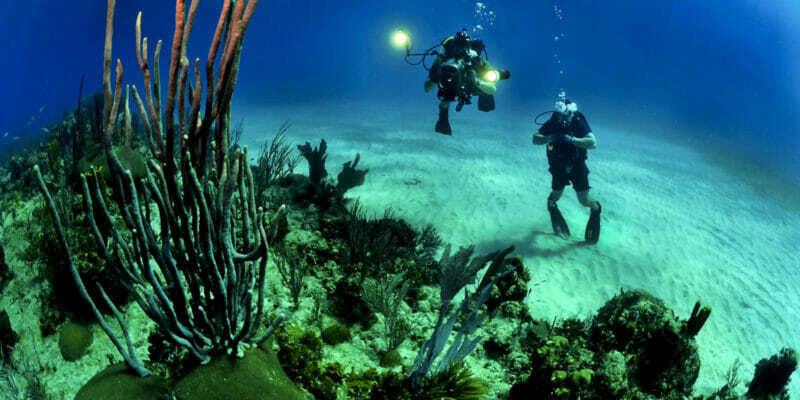 You can start this on dry land, and then proceed to shallow waters. Once they’re used to sitting inside the kayak, start out slowly by paddling on calm, still waters. When they’re comfortable with calm water, you can progress to choppier, deeper waters. Life is an ocean – Jump in! 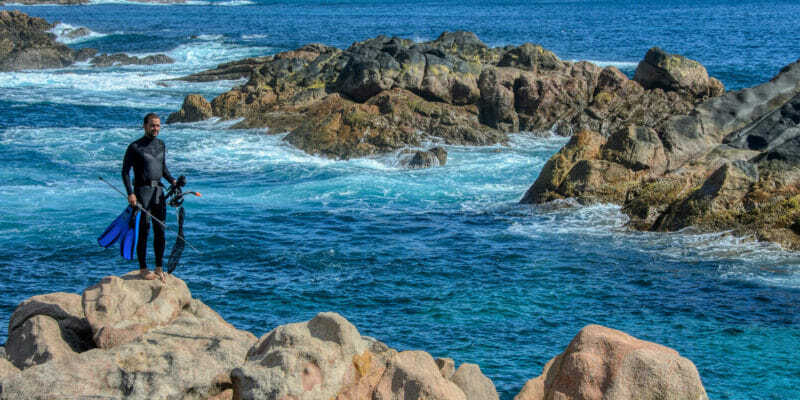 The Coastal Side is a participant in the Amazon Services LLC Associates Program, an affiliate advertising program designed to provide a means for sites to earn advertising fees by linking to Amazon.com and affiliated sites.